Okay, here is what I bought for the 5-4-3-2 Etsy for October. Autumn Crochet Pattern from Purl. So far I have made the pumpkin pie, but mine turned into chocolate cream pie, the pumpkin and 3/4's of the turkey. If it was not for LOST coming on last night, I would have taken pictures... .later..
Amigurumi Cats the three cats pattern... aren't they too cute. I made them, but none of them have eyes. I cannot find cats eyes... so they look well, scary... anyone have any ideas on where I can get cats eyes for toys? 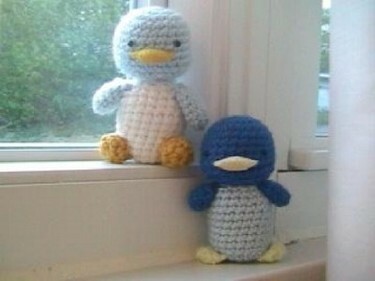 And the A- Little Birdie Amigurumi PDF Pattern . 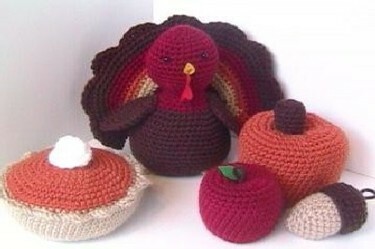 I have not made them yet... hopefully I will have time now that the cold weather has set in. Those are all adorable, but OMG those birds are precious!! You go girl ,great job with your ETSY purchase,your little witch below is quite adorable!